The UHF windshield tag is designed to be attached to optimization design of automobile glass. It meets EPC Global C1 G2 as well as ISO/IEC 18000-6C. It has a unique ID and can store additional information. It can be directly stick to the automobile’s windshield. Mainly applied in vehicle management, vehicle charges, auto glass retail management and so on. Various designs, color are all available to customize. Provide Logo printing according to customer’s request. The double composite windshield label can be printed on double sides according to customer’s request. 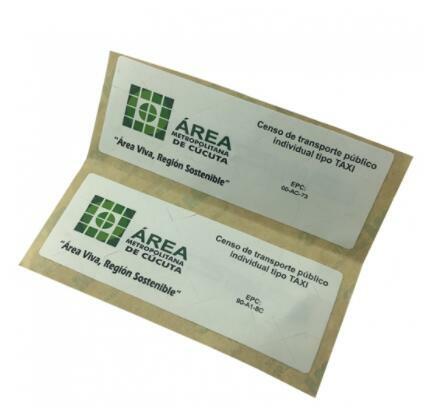 The UHF windshield label tag is covered with a waterproof membrane that prints and has good performance in terms of reading and storage. The label has a removable base layer and a removable adhesive pad for easy installation. Typical applications include vehicle access, parking and toll station management. The RFID windshield label is mounted on the vehicle’s windshield for vehicle access, accessibility for personnel access, highway tolls, parking lot entrances and exits, and access control. It can also be used in civil and military defense projects.